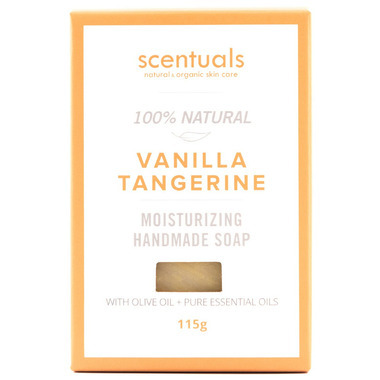 Handmade with a vibrant and bright blend of vanilla, sweet orange pure essential oils and nourishing Olive, Palm and Coconut oils, organic herbs and spices. This 100% natural soap creates a rich lather and gently cleanses while hydrating skin. Highly recommended for people with sensitive skin, eczema or psoriasis. Lovely scent that is not overpowering. However, the scent doesnâ€™t last on the skin after use at all. The bar is not overly sudsy.